Today we were supposed to get 2 - 4 inches (5 - 10 cm) of snow over ice. As a result the Wife had a snow day and had a delicious morning sleeping in and catching up of her TV shows. My job today was to go out to clear off the snow which was not bad at all since we received only about an inch or so of snow. The wind blew most of it off the driveway. It also turns out that we had little or no rain after midnight unlike what the forecast had predicted. There was still some ice under the snow but much less than I expected to see. There was enough that I spread deicer on our driveway, our neighbour's driveway and the sidewalks. I'm also grateful for the spiked slip-ons I wore to keep me from slipping around. The little snow we had did provide a nice backdrop for the cardinals eating out of our backyard bird feeder. A cardinal taking a break from stuffing its beak in our bird feeder. 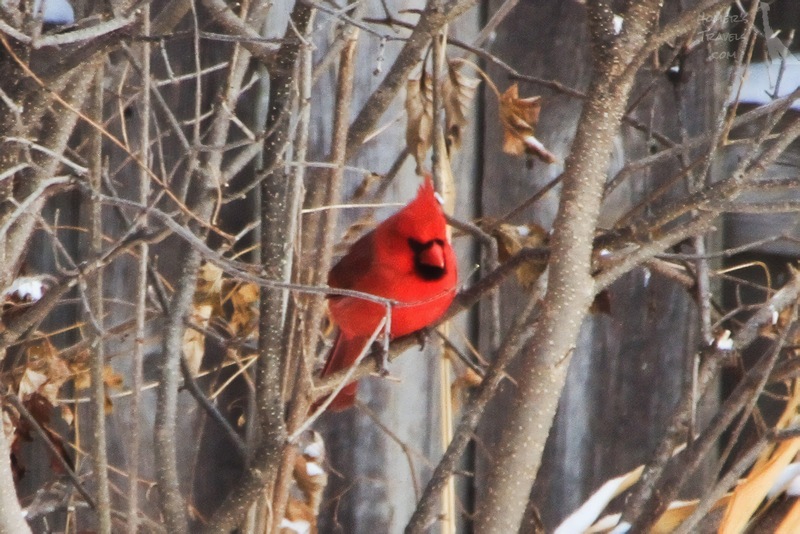 I've seen cardinals in our backyard before but it's rare. I recently changed the mix of bird seed in the feeder to see if I could attract different birds. Sure enough, today, I saw three cardinals around the feeder.